So this is the last day of 2008. I am happy to say we have had a great year. It hasn't been perfect but it has been great. I put together a little thank you for everyone on what to do now we have a new year to look forward to. I hope you all have a wonderful 2009! 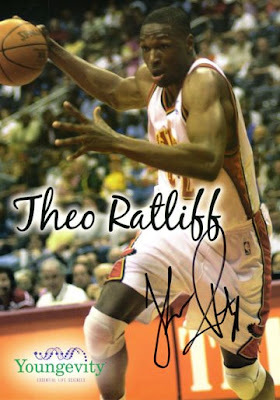 Theo Ratliff endorses Rebound fx - energy drink! So, how's your energy? Everyone has a different metabolism. Some need a boost. Some do just fine with the basic 90 nutrients. Stress and this crazy world we live in pump us up or let us down. How would you like to Rebound your energy! Put the bounce back in your step. Rebound is a high energy sports drink with the luscious taste of Melon Madness, Tropical Tirade, or Berri Boost (caffeine-free). Rebound fx is more than just a drink...it's absolute performance! Unlike other sports drinks, Rebound fx is a high-energy drink that offers a balance of antioxidants, natural herbs and important minerals such as potassium. * Best of all - Tastes Great! NBA All-Star Theo Ratliff has a lifetime contract with Youngevity to promote and endorse Rebound fx. Theo said, "It is a great honor and privilege to have bestowed upon me to represent a company and products that have helped revitalize my career and that represent sharing nutrition throughout the world. I am excited about being a permanent part of Rebound fx and providing what I feel is one of the important missing Youngevity links in sports health, Rebound fx." Like many NBA players, Ratliff has been using Youngeviy products to insure his continued excellent health and to get that "competitive edge" so important to professional athletes. Ratliff's name and image are featured prominently on the packaging for Rebound fx. You will never know what you are missing until you try Rebound fx. I use the Drink act but my wife has a rebound all day every day. It really makes a difference for her and it can for you. The FDA has not seen or approved this message. 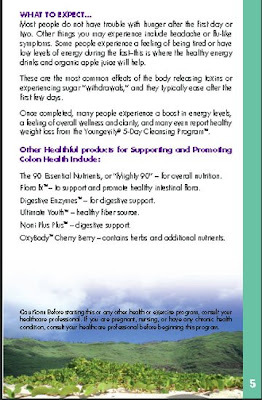 Go to http://www.mineralwealth.us/ for nutritional information and ingredients. Remember the price shown is retail. Ask me for information on a considerable reduction in cost. Question on MLM- Are the products worth the money? What a great day! I was very fortunate today to get a letter from a person interested in Network Marketing. He posed an incredible question that myself and many have asked regarding Network Marketing and I want to include it today and also give you my answer for Richard. I have watched the two presentations on your website and feel they explain network marketing better than any others I have ever seen. (www.whatrichdo.com) I have no problem with the concept of MLM or network marketing, in fact, I believe it is a good business model. My concern is that I have not yet come in contact with a network marketing company that sold products or services that I thought were a good enough value to warrant my enthusiasm for the product and/or the business. I have a test that put any MLM product/business opportunity to and that is: Would I buy this product or service at the retail price if I was not involved or associated with this business? I have not found products or services yet that I could answer “yes” to this question. I would dearly love to find a business that markets products/services that are uniquely good enough and/or are a good enough price value that I or anyone I know would buy them. So, having said all that, what company do you represent and what products/services do you market? Do you sell them because you really, truly believe in them and that anybody would be better off using them or do you sell them because you make a lot of money doing it and even though it’s not the greatest deal going, again, you make a lot of money doing it? I want to find a product/service that I think is so good that I would want to talk to my family and friends about it because I think it is “that good” instead of feeling like I’m trying to push something on them so I can make a little (or maybe a lot) of money from their efforts. You said that you were skeptical at first. I have had enough experience with network marketing companies and products that I too, am skeptical, but not about the business model, but about the other things I have already mentioned. I would love to hear from you and have you “open my eyes” to something that I have missed in all this or tell me about a product or service that would meet my “should I get involved?” criteria that I mentioned above. You can contact me at xxxxxxxxxjuno.com and I look forward to hearing from you. I also am at a disadvantage, not the same one you have, but similar in that you don't know what company I represent and I don't know anything about you. My first choice in telling you about my company would be for me to know more about you so that I would know what you would be interested in and feel it would be something of value for you. Price point is important but not always the most important thing in network marketing. The experience I have had with the value of our products is that they are worth 10 times what I pay. Not knowing you, I would not know if you would feel the same way. The thing you have to know about me is that these products saved my life. I don't know where it was that you found me on the Internet because I am all over the place, but if you did read my story you would know how these products saved my life. Back in 2002 I was diagnosed after multiple tests by MDs and given six months to live because of congestive heart failure. This was devastating to my family and me. My life has been full with various businesses and a continual participation in General Contracting. At about the same time I got this horrible news, I was carrying a palette of marble and tripped squashing the disk in my back at the fourth fifth lumbar. I spent two months of my six left to live in trying to use chiropractic and everything I knew to alleviate my horrendous pain. Finally, time was running out but something had to be done. I went in for back surgery and the operation was a success, but the result was I was told I could lift 5 pounds at the most for months. I would be able to work my way up to somewhere around 20 pounds within the year, which finished my career in General contracting. I had about three months left to live when I was given a tape from a trusted neighbor that told the story of a man named Dr. Joel Wallach. I grew up in a neighborhood where about every other house had a doctor living there. The name of this tape was "Dead Doctors Don't Lie." As you can imagine, the title was heresy to me. Even still, I listened to it because I was desperate. What I heard led me to believe that if it was true and that if I made changes, I would live. I paid the $10 and signed up in the company American Longevity. Long story short, I took the products and yes it cost me more money than I wanted to spend but because of the products and Dr. Joel Wallach I lived. My life is not perfect, there was damage to my heart, but I continue to take the products and I'm still alive. 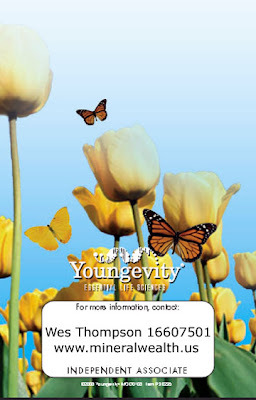 The name American Longevity was changed to Youngevity a number of years ago because it was a poor fit with our international business. 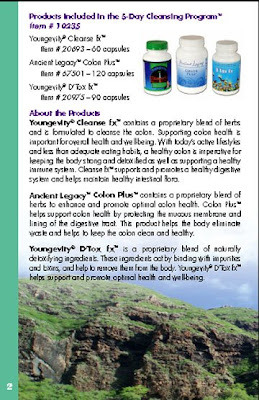 Youngevity has been purchasing other companies the Wallachs felt were of value because of excellent products. They pay cash and our company is still debt free. 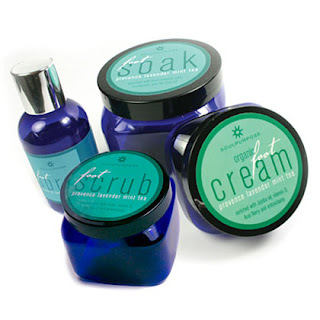 This has led to a product line of over 450 products. We have things from: nutritional products, household items, Suzanne products, Essential oils, make-up, skin care, multiple diet products, and a separate business with energy drinks, etc. 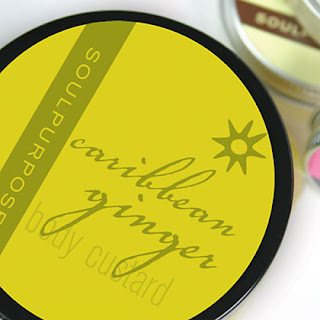 The only way to assess the full product line is to look over the products on my website. I hope this helped you to see my perception of the value of our company. I want you to note that I have not talked about wild income claims but hope that you have seen I would take the products if I were making no money. Many people come in our business for the products and earn just enough so they can get those products for free. In fact the greater majority of the people in our business that is their goal. The ones who want to make big money also find a home in Youngevity. It was my backdoor out of my General contracting career. The truth is that what it is for you is up to you. We are back again to the question of what you would see in this business and not knowing you I cannot say if you would make any money or not. I hope this has been of value to you and that you will continue to look into my business. My websites are at the end of my signature and I have a blog that goes into some of this information in more depth. So that's it, a great question and my take on the answer. 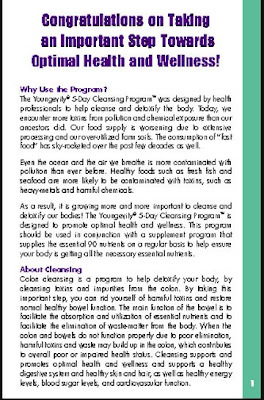 The topic today is Youngevity's 5-Day Cleansing Program. 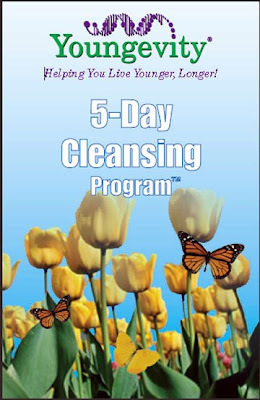 This is an awesome program and it works like a charm. 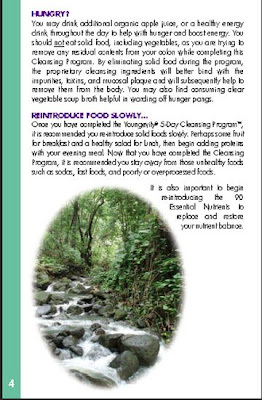 Since there is a brochure, I will just include the information from the Youngevity brochure. 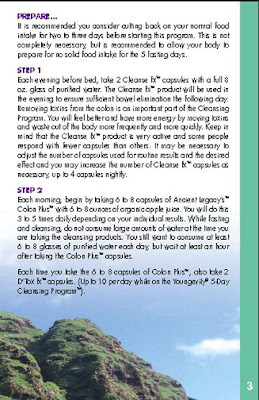 I hope, if a cleanse is in order for you, that you will give ours a try and that it works as well for you as it does for me. Anyone for another new company? This one is also fantastic! The new company is Soul Purpose. 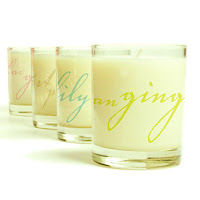 We were able to sample some of their fragrances at the Thanksgiving party. All I can say is "Incredible!" 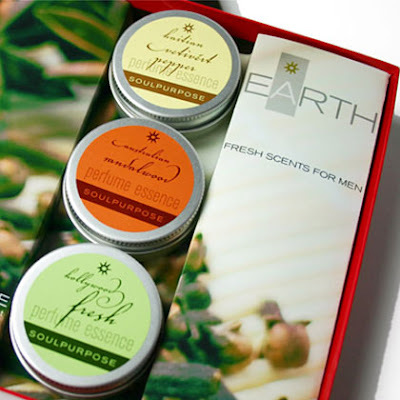 Products for the senses galore is what's in store. If you are the type that occasionally take time out for yourself to unleash your inner child, this is for you. Me, I'm just a guy and I prefer a quick shower. Not to say I don't get back in sync by smelling like fish occasionally. Rather than try and look like I know what I'm talking about in scents and oils when I don't. 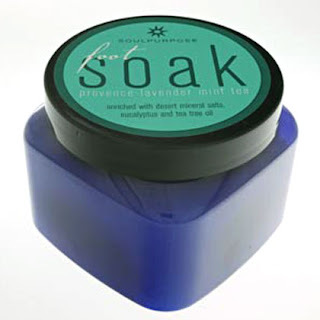 Here is a short list just to whet your appetite: 9 Butter balms, 10 Scents, 6 Candle scents, 6 Custards, 6 Shower gels, 6 Body Lotions, Different Foot Systems, 7 Perfume sets, Many gift sets. I'm not doing this justice, how about some pictures. All I can say is check it out! Go to my website and look over the whole list. 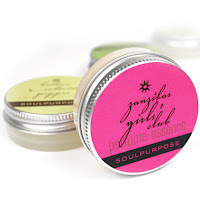 Click on products and at the bottom of the list is the Soul Purpose. I know you will be ecstatic! By the way the prices shown are retail. I can show you how to buy at 30% off. Is Your Dog or Cat in Your Will? Are you a pet lover? Is your dog or cat a member of the family? Have you ever heard your kids ask if your dog was in your will? You may think I am kidding or you could know exactly what I am talking about. If you do know, then I have a product for you. That product is Arthrydex by Youngevity. The thing you need to know about Dr. Joel Wallach, it's creator, is that he was first an extraordinary veterinarian. Doc knows about animals. He spent many years studying them. He started high school with a part time job at the St. Louis Zoo. He did very menial work so that he could work with and be around Marlin Perkins. In less than two years he had worked up to helping the legendary elephant trainer Floyd Smith. Doc was given a notebook to record every morsel of food fed to Florence and Pearl, a pair of two week old baby elephants. It began with bottles of milk and later on the things you would expect, such as celery, grapes, beans and summer grass. What Doc did not expect was the handfuls of blue clay that the little elephants ate like candy. He asked Mr. Smith what it was and he said it was extremely important as a source of trace minerals for the little elephant’s survival. This experience stirred Doc to pursue becoming a zoo and wildlife veterinarian. That is exactly what he did. He went to agriculture school and received a B.S. degree. He went to veterinary school also during the last 2 years of his AG degree. Doctor Wallach graduated as a Doctor of Veterinary Sciences. He also went on to add the N.D. for Doctor of Naturopathic Medicine to his titles. I say again, Doc knows animals! Arthrydex is incredible. It is formulated to support healthy bones and joints in small and large animals. It works! My son Ryan has a large Golden Lab named Web. He is an incredible dog. Web is trained like no other dog I know of. When he was young Ryan ordered some of the product. It was his first order and he didn’t know what to expect. Ryan opened the box and here is his incredibly well behaved and well-trained dog busting into the products and grabbing a container and flying out of the living room and into the bedroom with Ryan screaming right behind him. Web was tearing open the package when Ryan stopped him. There were many products in the box. How did Web know which was for him? He just knew and he loves it to this day. A few years later Ryan was broadsided in an intersection and Web was slammed into the dashboard. His hip was broken. Ryan put Web on the Arthrydex even when he was short on cash and couldn’t afford products for himself. It has made a huge difference in his life. Just so you don’t think Web is special above all other pets, Ryan sells Arthrydex to a friend and recently she called in a panic because her cat had gotten on the drain board and ate a whole box. He assured her that it is all-natural and the cat would be just fine. My mother’s Poodle goes nuts for it and I could write three blogs about Roger Robert’s Iditarod Husky teams. This product is everything and more that I say it is. Buy it and try it. 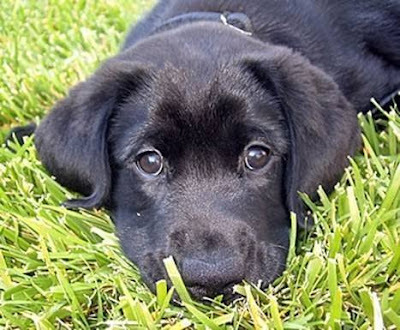 Your dog or cat will love you more than it already does. Remember, you said he was one of the family!